When it comes to bass fishing, Central Florida has it all. You can come visit and experience this travel fishing destination all year long and land fish. Largemouth bass is the best fish catch as they are abundant in all freshwater lakes. Weekend Central Florida Fishing can truly provide memories worth remembering. Lake Toho in Kissimmee is a bass fishing Mecca. Enjoy coming and traveling to this lake with your family and landing largemouth bass in numbers and quality. Summer months can be very effective time of year to fish Lake Toho. Our local experts work endlessly in order to get you on bass all trip long. Captain John Leech is a local legend when it comes to fishing Lake Toho. Stacy Nichols and his son-in-law were traveling to Experience Kissimmee for all that it had to offer. They were pastors from Georgia and were looking to get some vacation time in Central Florida. While here, bass fishing was on their list of outdoor activities to partake in. Lake Toho served them right for a couple days on the water. The largemouth bass were biting strong right off the bat. They were out of bait in 2 hours and threw artificial baits afterwards. Stacy and his son in law came back fishing since the bite was so good a couple days after. They got to experience another incredible day on the water with fish weighing up to 5.5 pounds. You truly can’t beat the action here on Lake Toho. Every month and day will provide you with a unique feel for bass fishing. Don’t miss out on the action while the bite is still strong. Captain Steve is looking forward to fishing with the Nichols family again in the future. 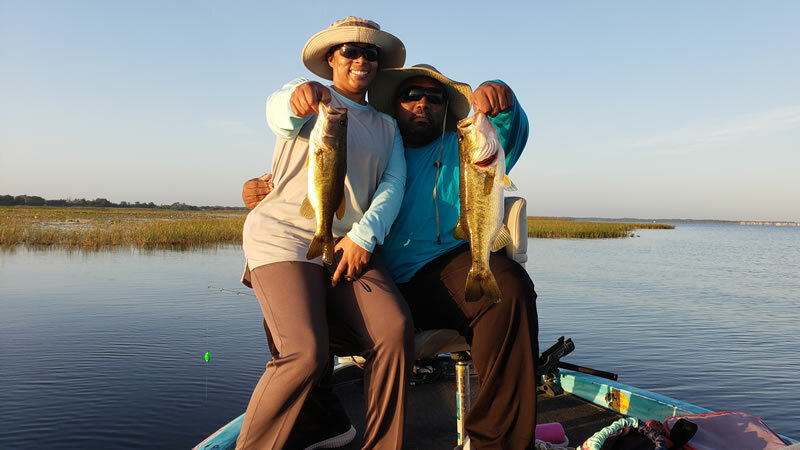 Just shortly after this incredible fishing trip, Darnell and his wife went out on Lake Toho to spend quality time on the water. There is no better way to do this than summer time bass fishing. Darnell is in the Navy and we proudly support those that serve our country. Darnell’s wife was in the hot seat on this fishing trip catching largemouth bass right and left. They had a great time fishing with Captain John Leech reeling in over 20 bass on their quick fishing trip. Just to sit back and set the hook was well worth it for both of them. Darnell and his wife caught fish up to 4 pounds. Captain John is looking forward to landing more quality bass on their next fishing adventure to Central Florida! When planning a vacation to Central Florida, consider taking a guided bass fishing adventure with one of our local experts. They will put you on a bass of a lifetime. Our no fish, no pay policy is an attractive lure that will make sure your captain works endlessly to not only put you on fish but quality fish. Here at Bass Online, we specialize in catching bass on all of our weekend Central Florida Fishing charters. Don’t worry about a thing and hop on board with your family or friends for an adventure of a lifetime! If you enjoyed this post about Weekend Central Florida Fishing, you might also enjoy this fishing report from the same area.